I wanted to start out by taking the time to thank all of you who sent emails with your thoughts and prayers for my friend who battles cancer (see Days of Shock and Hope). Due to the kindness of Low End Mac's publisher, Dan Knight, and another kind soul who wishes to remain anonymous, I was able to find a laptop and spare battery for my friend. I will give this laptop to her at the end of the month, once she's been back home for at least a week. Thank you to everyone for your prayers. I will keep you and your families in my prayers as well! As time goes along in the Mac world, the reality of obsolesce rears its ugly head. In the computer world, one cannot escape this inevitable reality. Whether you dabble in PCs or Macs, no matter the OS, you'll become a victim eventually. This is even more painfully evident during times of major transitions. Take the move from 68k to PowerPC: On the surface, the transition was seamless. Behind closed doors, it was a tough blow to everyday users. Witness the same thing happening now as the major transition from PowerPC to Intel has taken place. One can look to the upcoming release of Mac OS X 10.5 "Leopard". The gap for upgradability is narrowing, meaning that with each major OS release, fewer and fewer older Macs will be supported. For those of us who cling to simpler times, the days when System 7 and earlier versions of the Mac OS reigned supreme, it leaves the question: How relevant are 68k Macs? I currently have several 68k Macs, which all serve a purpose at any given time. My 68k Macs include a Plus, SE, Classic, Classic II, Color Classic, Performa 460, and a PowerBook Duo 230 (15 years old today - see 4 Hits, 2 Misses: 6 New Macs Introduced 15 Years Ago. While they all run different things, my main attraction to them is one simple thing: They harken back to a simpler time, a time before instant messengers, the Web, iTunes, YouTube, and other cool things that came with the Internet. While all of these things are cool, they can be distracting. I never go to my Mac mini to write. Why not? I simply don't want the shuck and jive of the more bloated OS X. Now keep in mind, I'm not dogging OS X completely. I love OS X due to its robustness and its ability to handle anything that's thrown at it. I speak only of huge bloat: I don't need the "Wow, looky there, you can see through the menu" type eye candy - just give me System 7 or an older System, and I'm one happy Mac user. From the time you turn on a 68k Mac, you instantly know you're safe. You can shut out the world around you and focus on your creative process. When that Happy Mac pops up almost instantly, you know you're back in a familiar small town where everyone knows your name. You get a warm, fuzzy feeling that only that old time Classic Mac OS simplicity can provide. You see the "real" Apple menu, the Application menu, and a Trash can in the lower right corner of the screen where God intended it! You can go completely basic with TeachText or SimpleText, or you can go all the way up with features galore in Microsoft Word. Many times I'll use TeachText or SimpleText, but there will also be times I choose to use WriteNow, which is one of the simplest, leanest word processors you'll ever find. I still find myself at times looking on in fascination as I see the simplistic nature of the old Mac OS. It's something that's truly lacking in OS X. And when the work is done, there are those cool Mac games you can relive. Personally, I love looking at the After Dark screen saver. For those who have More After Dark loaded on your 68k Mac, you'll find a cool game called Lunatic Fringe. There's nothing quite like it! In a world full of gigahertz CPUs, translucent windows, iTunes, and countless other whiz bang wonders, 68k Macs are plenty useful, and I believe they'll always have a place when all you want do is "Keep it simple and without the bloat, ma'am." I'll do all I can to keep the flame of the 68k Mac alive here on Welcome to Macintosh. I'd like to turn this over to the readers: I want to start a new series asking you, "What do you use your 68k Macs for? What drew you to the Mac? (if you started in the Classic Mac OS era)?" If you have a story to tell, send it to thomas (at) lowendmac (dot) com. 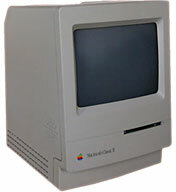 Any stories sent in will be used in future Welcome to Macintosh articles (with your permission) ! Rock on, 68k Macs, rock on!